Whether or not there is still a 100 page limit wasn't ascertained in the last thread, however, as that one was getting close to that limit, I thought it wise to start a new thread just in case. For any newbies, the purpose of this thread is for us to showcase our renders and to discuss what it took to make them. That's why you may see a page or two with few renders. All platforms are catered for be it DS, Poser, Bryce, Vue or whatever you happen to be using. currently playing around with the Luxus plugin and LuxRender, looks like I'll need to rethink lighting when using this.. going to give the currently render some time to run. Cool, looking forward to seeing what it can do. ok I got this after a hour and a half, around 700 samples per pixel..
am now in the process of updating graphics drivers so I can use Hybrid mode. Still a bit grainy though. It might need a few more hours before that clears. yeah looks like an old grainy photo atm. anyway got the hybrid mode working, and its about 2x faster, but after an hour the results didn't look as good.. still playing with settings. If you're using a sky and an area light, you may have too much light. Remove one of them (most likely the sky light.) Sky is really for outdoor scenes, though it still my be too bright and harsh. You certainly seem to get the most out of it, that's for sure! Often your lighting rig will heavily contribute to the amount of noise in the final image as well. Patience is a virtue, but there's no sense in creating a scene which will take 5 days to render when you can reduce the number of lights and get it done in one. This goes double for any scene which uses volumes such as fog, since Lux is trying to calculate how two sets of light passes through the same materials. Been hard at work trying to get realistic subsurface scatter for skin in Luxrender lately, and my results have been very mixed. Hopefully I'll hear back from one of the boffins of the Lux community to figure out the minor issues which currently plague me, but until then I'll just keep experimenting. It's the one linchpin which prevents me using Lux for anything besides scenery, since the people in the image look almost like plastic action figures compared to the scenery they're placed in. It's very distracting for me. Here's my latest attempt, but the SSS effect seems too subtle, so I might need to make some alterations. In an ideal world I'd have a muscle map texture I could place under the skin. The idea being that if the skin is translucent and the muscles underneath are accurately simulated, the result would be close to real life. Out of interest, what were your settings for SSS? after the NamedMaterial line in each Skin attribute block. In order to set the material to glossytranslucent you will need to check "translucency" and move the slider all the way to zero. Intertesting that you're using sigma_s values of lower than 1. In the Luxrender documentation it states that this represents the interior density and that values higher than 1 are recommended for interior volumes for subsurface scatter. As a result, I've been using quite high values (in the region of 100+), so perhaps that's part of my problem. Time to retreat to the drawing board and see if I can't remedy this unique problem. Edit: One thing I couldn't help noticing is you have comma's in your sigma values. I too have a habit of adding them, but Lux doesn't seem to like them and throws up an error if I use them. Every other source file I've seen simply uses a single space between values instead. However, I'm having trouble applying my UE lights to things like interior scenes, especially ones lit by 'natural' sun light. l typically end up with really crummy lighting compared to what I am used to, either too dark or washed out or otherwise rather ugly. I've been trying to setup lights to represent the light streaming through windows, but this rarely has the effect I am going for. In these cases, the UE actually somehow seems to make things look worse! Do you guys have any general tips for using UE in a situation like this? Are you using directional lighting? If so, try using soft shadows only and relying on your 'sun' to provide the major shadows in the scene. I'd use area lights (if you have them) then position them outside the windows. Then you would assign a light color to correspond to the time of day or type of light. 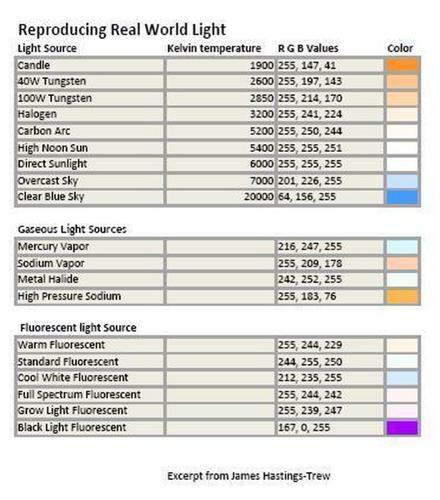 This chart was posted a in the old forum..
EDIT: Got my wires crossed, but you can assign these colors to get the type of lighting you want. The composition is nice, but, I can't help feeling that there's a light missing. It looks somewhat dull. The top one seems to suffer from the same lack of light as Herald's does. It probably cuts down render times, but, if you're left with a dull looking render then whatever time it did take seems a little wasted. I do like the character though, she reminds me of the actress Dakota Blue Richards. Your second render is much better as there is light and life in there and it makes for a very eyecatching scene. The composition is nice, bur, I can't help feeling that there's a light missing. It looks somewhat dull. That's largely a result of the materials being used. I can adjust the tone mapping to make it brighter, but it ends up looking washed out and faded. Like I said, I'm experimenting mostly, trying to find the best settings for decent SSS effects using Luxrender. I would change her hair though, too much of her face is hidden and the dark hair is disappearing into the background. All the renders I seem to do are tests, so much so sometimes that I forget what it is I'm testing. I want to buy up a few more Lantios sets and maybe get into Lux when I'm more comfortable with everything else. I'm having to completly rethink lights for working with Lux, more is definitely not better. Quite the opposite in fact. You want as few lights as possible when working with any Lux scene. Since Lux simulates light accurately, it's doing billions of calculations per light source. Too many lights and you get a mass of noise which can take thousands of samples to clear up. Some of my early works are still dotted with noise even after 3000+ samples per pixel and over 100 render hours. In fact, it's so bad that all of the works I've posted both in these forums and on my DA account use a maximum of two lights. I have at least 15 different works which I'll probably never post because they're noise-ridden messes. My current render, albeit using SSS, is clocking in at 516 samples and has been running for the last five hours and 37 minutes! It only uses a single light source, but has an efficiency rating of nearly 3000% and still looks as noisy as a test render. actually I think I got it right.. more is NOT better... 3Delight you need a bunch of lights (3 minimum to get decent lighting or use UE) with Lux one or two seems to work the best.